As a basketball fan, I am sure you are aware of the Jeremy Lin story that made NBA and the New York Knicks, in particular, relevant again. And perhaps you are also aware of the controversial headline at ESPN’s mobile website that had gotten the editor/writer responsible for the headline fired. The dismissed employee has apologized and stated that it was an honest mistake and he had no intention of being funny or punny. I read many of the comments from users that claim that they weren’t even aware of racial connotation until it became an issue. I don’t know if the writer is telling the truth or not, but if he was, this would imply that he saw Lin as just another person, not another race. In effect, he was color-bind. Isn’t this what minorities strive for, equality irrespective of race? Let’s consider the situation: the previously floundering basketball team finds a new hero and the new hero not only brings back the team but made it appear almost invincible then amid the feeling of this invincibility, the team suffers a loss. The phrase, a chink in the armor, seems to be perfect for describing this situation. If the hero was not Asian, then the writer would still be happily employed. Who’s the racist in this situation: the people who got offended by the title or the writer who made an unfortunate choice of words (giving him the benefit of the doubt about his intent)? Nobody knows for certain how Jeremy Lin, the basketball player, will pan out. He may end up being an Asian American Kevin Johnson (49% FG percentage, 18 points per game, 9 assists per game,) make multiple All-Star Games and have an outside shot at being inducted in the Basketball Hall of Fame. (This is the probably the most optimistic scenario that is still within the realm of reality.) He may end up being a flash in the pan -- no shortage of those in the NBA -- like, say, Tony Delk, who scored 53 points in one game but otherwise had an unremarkable career as a bench player. Jeremy Lin in Harvard - Boston College game. But Jeremy Lin, the cultural phenomenon, has probably reached its zenith already. America has already come face-to-face with the many conundra that Jeremy Lin posed: How is America to handle a mainstream Asian American star? 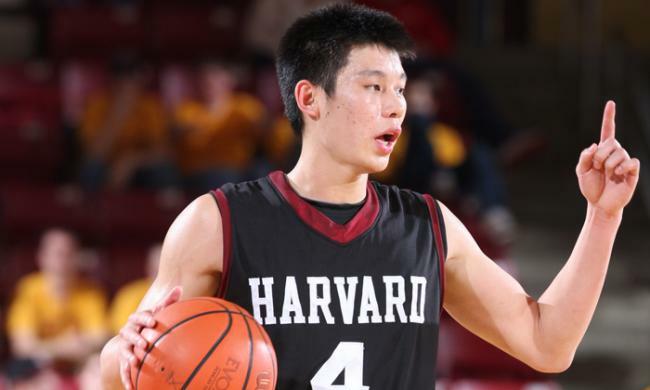 How is America to handle a prominent Asian American that rigorously fits (Harvard education, Tiger Parent,) yet completely defies popular images of Asian Americans (athleticism, masculinity)? Even if Lin goes onto have a long and highly decorated NBA career, it would merely serve as a reminder of the fact that, once upon a time, his mere presence alone forced Americans to reflect on how they must deal with Asian Americans. The question of racism involving Asian Americans is a tricky one for a country that is accustomed to looking at the issue of racism through the lens of the African American experience. R's question is difficult because "chink" is not the same as "n-----". Often when Asian American race relations becomes an issue, the habits developed in the African American experience are shoehorned into the Asian American issue. The uproar over ESPN's "Chink in the Armor" headline has an element of that as well -- n-word is bad, and therefore so is the c-word. Yet those two are plainly not the same: there is no such thing as a benign use of the n-word, but the word "chink" has a benign use in a common expression. And as R noted, in his apology, the ESPN headline writer makes a convincing case that he intended to use the word in a benign manner. When a variation on a theme poses an unfamiliar challenge, it is often helpful to return to the fundamental principles. Race relations involving Asian Americans present new challenges that did not exist in race relations involving African Americans. Those new challenges are more easily met if we have a basic framework in our mind that answers the most fundamental question -- what makes something racist? So here, the Korean will present one possible framework of dealing with that question. "The father of my ex-girlfriend was a rare breed -- a real deal racist. I'm not talking about someone who has a lapse in judgment and says the wrong thing from time to time. He genuinely believed that black people were inferior to white people. But whenever a black person happened to cross him, he would never yell, "you damn n-----!" Instead, he would yell: "You damn Democrat!" That way, nobody would accuse him of being racist." This anecdote shows the ultimate vacuity of what may called the "magic word" approach to racism -- the idea that as long as a person does not say certain words, the person's record as to racism is unapproachable. Regardless of the precise word uttered -- either "n-----" or "Democrat" -- the man described in the Korean's friend's story remains just as virulently racist. From this, we can glean what the Korean would consider the "first principle" of racism. What makes something racist? It is the racist intent that makes something racist. For the man in the story above, the words "n-----" and "Democrat" serve the same function: to express his racist disdain toward African Americans. The precise vehicle by which the man delivered the racist intent does not matter. What matters is the intent delivered in those vehicles. This first principle, in turn, presents two challenges. First challenge is: short of mind-reading, how are we to discern intent? Answer: we infer intent from the visible signs of intent. Critics who believe "racism" is an overused charge often argue that it is not possible to discern people's intent. Not so -- if that were the case, we could not have criminal trials, in which the jury is asked to determine the defendant's guilty intent. Based on a person's words and deeds, it is entirely possible to infer intent by listening to people and looking at the facts and circumstances surrounding the event. Let's go back to the umbrella example, and suppose we are facing a defendant who took an umbrella, but swears that she thought the umbrella was hers. We can look at a number of external factors to figure out if she is lying. For example: what does her umbrella look like, and what does the taken umbrella look like? How similar are the two umbrellas? How does the defendant describe her own umbrella? Where was the umbrella taken from? (A common umbrella holder in a restaurant? In a crowded house party? From an apartment hallway shared with neighbors?) Was it raining outside, thereby supplying the defendant with the motive to steal an umbrella? Did she in fact have her own umbrella there? Of course, these questions will not be enough to infer every last nook and cranny of the person's mind -- doing so would truly take a mind-reader. This limitation should make us humble and cautious about making judgments. Before we attempt to infer intent, we must make sure that we looked at all the facts and we heard from all relevant people involved. Even after we infer intent, we must be open to possibility that we made an error, and must stand ready to be generous with our forgiveness. Nevertheless, if we are as serious about combating racism as we are about combating crimes, we must give our best attempt at inferring the intent. If we accept that racist intent is what makes something racist, we run into the second challenge -- that is: how do we correct the behaviors of people who may not have racial animus, but who simply do not care? If a racist intent is what makes something racist, what do we do with people who do not form a concretely racist intent? This challenge, however, is a mistake -- specifically, it is a mistake of confusing "intent" and "intentional." Here is another area in which referring to criminal law is helpful. Recognizing the fact that a guilty mind may have different levels of evil, criminal law provides a graduated scale of intent. "Intentional" is a part of that scale, but is not the only part of the scale. Suppose the driver A runs over the pedestrian B, and B dies. In all of the following scenarios, the act (A running over B with a car) and the result (B's death) remain the same. But the legal consequences for A depend greatly on the level of A's intent. In American law (just to use a familiar example,) there would be largely four levels of gauging A's intent. It is possible that A intentionally killed B. Because A hated B, A hatched a plan to kill B by running him over with her car. A shows up to a crosswalk where B crosses every night as he leaves from work, and mows B down. This would be considered an intentional homicide, and would generally come with 25 years to life in prison. It is possible that A intended to injure B, but ended up killing him. This usually comes with 15 years in prison. In these two scenarios, the level of intent is "intentional." However, more importantly for our purpose here, A cannot escape punishment even if she held no concrete intention to specifically harm B. It is possible that A recklessly killed B. For example, because A was having a bad day, A was driving like a maniac, swerving around and running red lights, without thinking about the fact that she could hurt somebody. A never meant to hurt anyone -- in other words, A's actions were not intentional. But the fact that her actions were not intentional does not mean she did not have the requisite intent to establish criminal liability. The intent of recklessness, which results in death, still comes with a prison term of around 8 to 10 years in most cases. There is an even lower level of intent than recklessness. It is possible that A negligently killed B. For example, A could have been driving perfectly safely in her entire time of driving. But just as she approached the crosswalk that B was crossing, A's cell phone rang. A glances down toward her pocket as she is taking the phone out of it. That split second was enough for A's car to run over B, who was crossing the street. In this scenario, A's intent was arguably impeccable. Unlike in the recklessness scenario, A generally cared about people's safety. A's action was arguably an honest mistake of a kind that could happen to just about any person on any given day. Even so, A is potentially looking at up to 2 to 5 years in prison. For our purpose of developing a framework to think about racism, the intent of negligence is particularly important. After all, in this day and age, it is relatively rare to find someone who is intentionally racist. (Please note the use of the word "intentionally" as a term of art, rather than as its dictionary definition.) What kind of intent is "negligent"? Here is a legal definition of a negligent intent: a state of mind that leads to a failure of exercising a reasonable level of care that a person of ordinary prudence would have exercised. Importantly, the definition of "reasonable level of care" is set regardless of who you are, and what situation you are in. In the last scenario, A could have been waiting for a very important phone call -- the result of her father's life-threatening surgery, for example. But that does not matter; when you are driving, "reasonable level of care" requires that you keep your eyes on the road. That last part is very important. Negligent intent covers even those who have no ill will at all, and forces them to meet a certain standard set by the law. Because people who do form concrete ill will are more dangerous and blameworthy, they are punished more severely than negligent people are. However, that does not mean that negligent people can avoid punishment entirely. In a society where a person is interacting with a lot of other persons, there must be some basic rule that everyone must follow, such that injuries do not occur. Having a clear understanding of negligent intent is important because negligence is an aspirational standard. Negligence is the standard that says "you are supposed to know this." By setting the standard of what people are supposed to know, it changes the behaviors of the people who wish no harm. Keeping in mind different levels of intent, how could one answer R's question? Here is how the Korean would answer. "Chink" is about as offensive a word one could throw at an Asian American. The Korean is willing to believe that the ESPN headline writer was unaware of that. But the writer was negligent. He is an educated person, writing a headline that would reach millions of Americans. The writer had time to think about his word choices. He should have known that, in describing the most prominent Asian American athlete at the moment, there is ample room for misunderstanding if the word "chink" appeared in the headline. One could hardly imagine that, to describe a great defensive game in basketball, ESPN would choose a headline that stated: "A Niggardly Effort". Although the word "niggardly" means "thrifty" and has absolutely no etymological connection to the n-word, a network like ESPN that reaches a huge audience should know the possibility of misunderstanding. That a lot of people did not know that "chink" was an offensive word (indeed, the most offensive word for Asian Americans) does not make the ESPN headline writer any more reasonable. Rather, it only reflects the pathetic state of affairs when it comes to how mainstream America deals with Asian Americans. As Jay Kang put it, America has largely turned a blind eye to racism against Asian Americans. It is not too much to ask people to know the most offensive term denoting Asian Americans. The ESPN headline writer was being racist. He should have known. This conclusion, however, must be tempered by the following considerations. Screaming "racism is racism" is intellectually stupid. As there are intentional homicide and negligent homicide warranting different levels of punishment, there are different levels of racism that deserve different levels of blame. There were worse things that the writer could have done; it is not as if the writer joined the KKK. One can reasonably argue that the punishment levied on the writer -- i.e. loss of his job -- was too harsh. (The Korean would be inclined to agree with that. 30-day suspension without pay might have been more appropriate.) Any condemnation of the writer himself must be made cautiously, keeping in mind the explosive power that the accusation of racism has in contemporary America. Just as much as we urge people to carefully consider racism in expanding number of situations, we must be ready to undergo an equally careful analysis before exposing people to harsh consequences. At the Lakers-Knicks game, I was teasing a colleague about his exceptionally wrinkled suit pants. It looked as if he had slept in them, then somersaulted down the street to Madison Square Garden. Meanwhile, Lin was having his way with the Lakers, scoring or assisting on seemingly every point. I was about to joke on Twitter that the only way Lin could be more impressive would be if he got the wrinkles out of those pants. I decided against it because it would have been too inside, a joke lost on just about everyone not sitting next to me. It wasn't until later that I realized someone could easily have misinterpreted the joke, believing I was playing off the stereotype of Asian dry cleaners. That wasn't a part of my initial thought process. I would have made the same joke about Kobe Bryant or any other star of the night. But Lin brought the possibility of a pejorative into play. The rules have changed. The lesson is to exercise greater caution, to consider all the ramifications of what we say. It's not too much to ask. It will lead to smarter conversations. And if that's the place to which Jeremy Lin has brought us, it's another way his impact resonates far beyond Madison Square Garden. The Korean is hopeful that most people will come to learn the new rules, as Adande did, without begrudging having to do so. Do not shrink of calling out racism, but give people time and careful thoughts. > One could hardly imagine that, to describe a great defensive game in basketball, ESPN would choose a headline that stated: "A Niggardly Effort". Although the word "niggardly" means "thrifty" and has absolutely no etymological connection to the n-word, a network like ESPN that reaches a huge audience should have known the possibility of misunderstanding. That and almost all definitions for 'niggard' or 'niggardly' emphasize the heavily negative connotations. The ESPN writer would no more use 'niggardly' than they would describe a good defense in a title as being 'miserly', which is a synonym (see meaning 2, 'niggardly' adjective, Oxford English Dictionary). 'Miserly', if anything, is less pejorative. 1. Colorblindness sounds nice in theory, but it doesn't work so well in real life. Why? Ignoring the fact of a person's race(s) wouldn't change the system that either favors or oppresses members of that person's race. Since this post is about Jeremy Lin, I'll use his Taiwanese race as an example: Even if the writer were practicing colorblindness, it wouldn't help improve anything because the system that has historically marginalized, oppressed, and fetishized Asian Americans would still be in place. Simply put, ignoring something doesn't make it go away. You could apply my example to any other racial minority and it would still hold true. Not to mention, ignoring someone's race could be offensive to that person if they strongly identify as a member of that race, because you'd be choosing to overlook part of who they are. I am proud to call myself a Chinese American and would prefer if other people didn't tell me they "don't see my race," because my Chineseness is important to me. 2. It is not racist to call someone out on their racism. It is also impossible for marginalized people to be racist (as in, practice institutionalized racism, NOT racial discrimination) against the dominant party. Only white people are capable of being racist; all other races can merely practice racial discrimination. It's an important distinction to make in discussions about race, racism, and systemic oppression as a result of race. I agree with your statement about the colour-blindness, but I think someone's "race" is not only about skin colour. Even if you see grayscale, you can't be blind to people's face shapes and details. If you are, that's another eyesight distortion. So colour blindness has no connection with the issue at all and I dunno why they mentioned it. It's like... He was colour blind. Okay, so what? Like.... He's wearing a T-shirt and blue jeans. So what? I mean, not relevant at all, is it? Great post... a lot of it can be reflected back on the Korea-based bloggers and commenters who have been shouting about blackface recently: the use of blackface on Korean television probably wasn't malicious... but after The Bubble Sisters, it's something they're supposed to know. Another great article. Racism towards Asians in general are less malicious and less intentional, which does in a lot of ways make it seem more tolerable to many, when compared to other forms of racism. It should however not be completely excused or ignored simply because it is more so "negligent" than "reckless" or intentional. Outlining these differences in severity absolutely is a step closer to people understanding the kind of racism Asian Americans face these days..
As someone who works in broadcast journalism, I think we need to give the anchor a little benefit of the doubt. He was reading off of a teleprompter and the expression "chink in the armor" means "a weakness exposed". That said, the writer of the article and the writer who wrote what was to go in the teleprompter should be reprimanded, but firing is going too far. And what about the editors who let it go through? Should they not also be held accountable? I think the writer/editor who wrote the headline on the mobile site is the person who got fired. The person who got a 30 day reprimand is a different person. And he was not reading a teleprompter. He has used the phrase before when not referring to an Asian American. It was a mistake to use the phrase in this context. To be in a public forum and to not know that the word "chink" maybe offensive to many Asian Americans when referring to an Asian American is an absurd notion. I applaud ESPN for their action on all accounts. I think your concluding point is right, but there's something missing in dealing with racism as an intentional act, or having to do with language. Slurs didn't organize, or particularly contribute to systematic oppression — most of them weren't even considered offensive (by those using them) when they were in widest circulation. The offense in them comes when those systems pass away and the casual language of slave-owners or British imperialists transitions into explicit self-identification with slave-owners by using their language, or détourned for "Yellow Peril" attacks. Suppose someone harbored hideous prejudices but didn't actively discriminate, denying housing, racial profiling, etc., or passively discriminate by overtly advertising themselves as someone who was unfriendly to people of a different race. Who would be particularly bothered? The obvious fiction of such a person (imagine prejudging and not, you know, ever using your judgement in decision-making), is why we latch onto the words, and to notions like intention, but I think it suggests also why both are ineffective for thinking about racism as such. Yes, holding racist views produces racist effects (even or especially indirectly, see traditional US reticence to institute a proper welfare state http://www.yorku.ca/crsp/issue51/issue51-14.pdf) but why should simple, or naive, ignorance of the cultures, ethnicities and identities that surround us? Because intention is the secondary effect. Whites, men, straight-identified people, cisgendered people, don't have races or genders or sexualities the way other groups do, they have weird negative identifications, white is not-colored, straight is not-at-all-gay-in-any-way. Ignorance or racial naivete is just a passive way of reproducing the non-race, non-gender. The laughable racist retort that pops up whenever a racial slur enters into mainstream discourse, about "crackers" (because we all live in 70's era Oakland, but whatever) is an exemplary artifact of this — you can't racially slur someone who "lacks" a race. Ignorance of racial slurs shows such a deep ignorance of one's own position in a racial hierarchy that racist is the only term for it. The problem is that by focusing on intention we've fried any analytical circuits for dealing with racism. By marking "acting racist" as an intentional state, it condemns the actor themselves, just as sin used to, and leads to exactly the flat "racism is racism" that is useless. Worse, it allows bigotry to persist in structures that aren't explicitly bigoted, like the crack vs. cocaine sentence differentials, or disproportionate imprisonment by race, or gendered and racial wage gaps, or on and on and on. I don't think the answer is to tear into anyone who makes a stupid (racist) mistake, it's to discuss how our society allows someone to make it to adulthood without knowing anything about their neighbors, and then to deal with the structural effects that exploit ignorance and ethnocentrism to perpetuate serious damage. 'C---k' may not be quite so loaded with opprobrium as 'N----r', but that someone who sells words for a living would not know it's offensive, even moderately, is stretching it. There's a reason it's used in jokes. I don't know, I grew up hearing "the n word" and knowing it was bad, but I had never heard the term "c---k" used as a slur until I was in my mid-twenties (and then it was in the context of someone explaining that it was a racial slur and not in the context of someone using it that way). Growing up the only people who told racist jokes around me were my racist grandparents, who only ever told jokes about African Americans. Just because you make your living selling words doesn't mean you know all the racial slurs that are out there. So while it's more likely that he had heard the term used as a slur and forgot about it, and then negligently used the term in the headline, it is entirely possible that he'd never heard it used as a slur. He *should* have known better (and so he deserves some fallout from the headline), but it's possible that he didn't. And it's also possible, and reasonable to believe, that he had heard the term at some point but just wasn't thinking when he wrote the headline. I think the point is that when using the word chink and working for ESPN, you SHOULD know the offensive nature of the word. If you don't, you should be fired. Everything is offensive to someone. Are we supposed to take collective action against such offensiveness only when those offended share a color or gender? Why not outlaw hating on people's age or height? After all, it also is something one does not choose and can not change. What is the major difference between "damn teenagers", "damn midgets" and "damn Irish"? After all, young people often have being young a large part of their identity, don't they? I don't think this is about race. First of all, race is not a biological term, it is an outdated attempt to classify humans based on their phenotypic characteristics. Anthropologists no longer use this term, but most folks still refer to it. I do think it is about ethnocentrism and ethnic stereotyping in today's world. Americans are pretty good about being politically correct. If I had to rate all the countries on political correctness, Americans would be up there. Some cultures are less politically correct than others. In some cultures, including mine, where the great majority of the population is more or less homogeneous, it is very easy to use derogatory terms towards ethnic minorities. It is even harder not to use them since the idea of ethnic superiority has been ingrained in people's mentality for centuries and even found its way into linguistic terms. When we talk about racism towards African American in Korea, I do not believe it is about racism. In fact, it has nothing to do with racism. It is a social status issue. I am sure Koreans have some nicknames border-lining ethnic slurs for Japanese and visa versa, but so does every other nation on earth, and both countries are Asians. So is it racism? This just shows lack of cultural sensitivity and the need to define cultural/ethnic boundaries, i.e. "my group" vs. "their group". But there is hope. Most so-called "white" people do not know how it feels to be different, when people look at you as if you are second class. Bringing these stereotypes into light, exposing them and explaining what is wrong with having them is a powerful way to show people the way it should be. The person who was fired because of that infamous headline will remember not to use this word for the rest of his life. As a matter of fact, everybody, who knows about this story will think twice about using this word. And that's a good thing. I believe that there are more things out there than just ethnocentric behavior that needs to be exposed. The amount of sexism, religious and sexual orientation intolerance is overwhelming. In the States it is almost impossible to admit that someone is an atheist for the fear of being ostracized. An African American president - yes. But a president who is an atheist America would never accept. Teaching political correctness, multiculturalism, respect for other people's religious beliefs, embracing other points of view and eradicating sexism or any kind of prejudicial thoughts is a noble goal for future generations to accomplish. We cannot change who we are, but we can strive to be our best. Can you imagine the brouhaha this would be creating if he played in a sport that Americans actually watched? Last year's finals was watched by slightly more than 5% of the population. Talk about another big mole hill. It's just too bad that he didn't take up the oblong ball instead of the round one, and we'd be hearing about the Hollywood stars lining up to date him like Tebow and Taylor Swift right now. Damn, it's the off season, and people are still taking about Tebow instead of the Super Bowl winner, Eli Manning, or the league MVP, that dude in Green Bay. @ Alex. For about three weeks there, I was in shock at how huge the Jeremy Lin story was getting in the U.S. When there are rumors of Kim Kardashian being interested in dating Jeremy, when you have Wall street people using Jeremy Lin as motivation, when President Obama is giving his opinions about Jeremy Lin's game, when the gear he wore in the D League is being auctioned for tens of thousands of dollars, when people are writing songs about a couch (lol), you know a story has gotten out of control. I can't imagine the insanity (< not gonna say it) in New York at the time. Thankfully, the hype has died down for the time being. He's still going to draw his share of negative criticisms of course, but hopefully, those will be reduced a bit as well so that he can have at least some breathing room to play, make mistakes, and work on his game like most other first and second year players can. The plea of negligence is scarcely credible here. 1. The writer didn't realize what he was saying. 2. The editor didn't notice anything amiss either. 3. No one else at the magazine saw it and thought to mention it was a bad idea. This reminds me of a famous case from Britain in the 60s. A robber shot a policeman after his accomplice said the words 'Let him have it'. The accomplice was, of course, prosecuted, and his defense was "I meant 'Let him have the gun' as in 'Give him your gun'. Just an unfortunate misunderstanding, judge!". The public's reaction: 'Yeah, right!'. Even if you accept that the accomplice was being truthful, use of ambiguous words in a tense situation involving loaded weapons is itself a culpable act. Negligence, as TK says. I almost feel that someone who makes this kind of defense plea deserves to have a contempt of court charge slapped on top of the existing charges. As to 2, there was no editor. It was past 2 a.m. EST where the headline writer was, and he pushed out that headline by himself. As to 3, the headline did not appear on any magazine -- it appeared on ESPN's mobile website. I still think the headline writer was negligent, but let's make sure we get our facts straight. JLR, when used in reference to Chinese/Asians, the word is ONLY used as a term of derision. And while I'm usually willing to give the benefit of the doubt when the chance of ignorance or simple negligence is anything close to 50/50, the "chink in the armor" pun is so hoary, it's impossible to do so in this case. It was not negligence. I don't know if you are aware of this incident in 1999: http://www.usnews.com/usnews/opinion/articles/990208/archive_000211.htm (this particular article is pretty obnoxious, but has a point to make). Howard was offered his job back eventually. According to Wikipedia, he said this about his experience, "I used to think it would be great if we could all be colorblind. That's naïve, especially for a white person, because a white person can afford to be colorblind. They don't have to think about race every day. An African American does." At the risk of repeating someone else's critique, you're letting ESPN off in all this. Where are the sub-editors? Where are the editors in all this? Why must the lowly journalist carry the can for what is essentially an organisational negligent racism, to carry-on your terminology? If the journalist is truly ignorant -- debatable, perhaps, but we'll work with it -- then surely his employer has a duty of editorial care, at least, to ensure that racist terminology do not creep, inadvertently, into their publications? Yet, where is ESPN's "sacking"? We are all-too-quick to let companies off the hook for their employees' actions when, short of outright employee violation of a code of employee conduct or another legal breach, the employer would be legally responsible for whatever has been done in their name -- a fact to which innumerable class action lawsuits attest. Regardless this, I love your work, The Korean! You're erudite and well-considered, and provide a welcome insight into both Western and Korean thinking and the culture underpinning both. Keep it up, please!